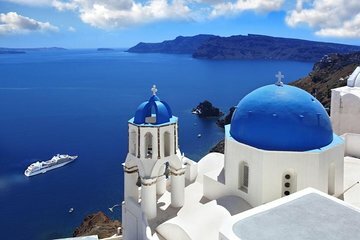 Si vous n'avez que peu de temps à Santorin, il est important pour profiter au maximum de votre séjour. Découvrez la spectaculaire île grecque par vos propres moyens au cours d'une excursion privée en bord de mer qui vous permet de personnaliser votre itinéraire en fonction de vos préférences personnelles. Un transfert depuis et vers un lieu signifie que vous pourrez commencer votre visite dès que vous sortez du bateau, et un guide privé vous garantit que vous bénéficierez de l'attention et vous aurez suffisamment de temps pour poser des questions. My husband and I had an Incredible experience with fabulous driver/tour guide Michael! For 4 wonderful hours he showed us the breathtaking highlights of Santorini and shared so much about the people and the culture of one of the most beautiful places we've ever visited. Michael doubled as an expert photographer, and we have gorgeous photos of us and spectacular Santorini to last a lifetime. We had an amazing day and hope to return to Santorini for a longer stay sometime in the future. Highly recommend this tour and are grateful for an amazing day! We had a very brief time in Santorini on our cruise. We wanted to see so many different parts of the island so we decided to go with this private shore excursion. We told our driver some of the places that we wanted to see so he took us to Profitis Ilias, the black beach, the red beach, Oia, and the Firostefani blue domed church. It was a whirl-wind and we wish that we had more time on the island to really spend time and enjoy each location, but our driver was great getting us to see all the places and making sure we still had enough time to enjoy the town of Oia. I would definitely recommend this excursion for anyone on a time-crunch wanting to see as much of the island as possible.